CST Industries offers TecTank FP, a jackable flat panel bolted tank. CST Industries expands its product portfolio with TecTank FP, a jackable flat panel bolted tank. TecTank FP was designed based on designs from Peabody TecTank, Columbian Steel Tank, and Columbian TecTank. The new design of TecTank FP includes an optimized bolt pattern, increased steel thickness, reduced hardware, and fewer penetration points. The new jackable flat panel bolted design will be available in short lead time pre-configured model and fully customizable designs. 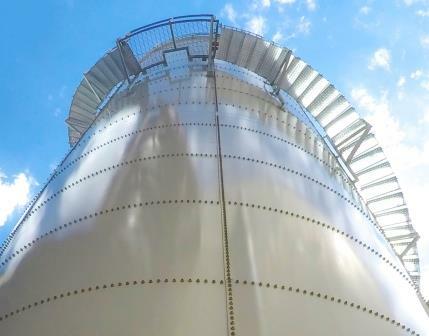 CST now provides both a flat-panel, jack-built tank and a chime-panel (CP) scaffold built tank, capable of safe and economical installation on every diverse site condition imaginable. CST holds a safety rate of .68, well below industry standard, and has over 350,000 installations in over 125 countries.